It was a star studded affair this night at Ace of Spades in Sacramento, which is somewhat unusual in this sleepy town. Burton C. Bell of Fear Factory helping on vocals for several songs to Jello Biafra of the Dead Kennedys and Gary Holt of Exodus in attendance. I would be lying if I said that Al Jorgensen didn’t look older, didn’t move slower, was reading some lyrics off of a paper, but I would also be lying if I said that he didn’t sound just as amazing as when I saw them in 2003. While it was a bit odd to me and seemed like the good majority of the crowd that most of their set were newer songs, and was missing some key tracks from albums like Filth Pig, it also had some key hits thrown in towards the end of the set that really sealed the deal for me that they still know how to tear the roof off of a venue. Ace of Spades has been increasingly gaining notoriety and after Live Nation buying them, they have now been able to bring those mid-size metal and rock acts that we could never have before. 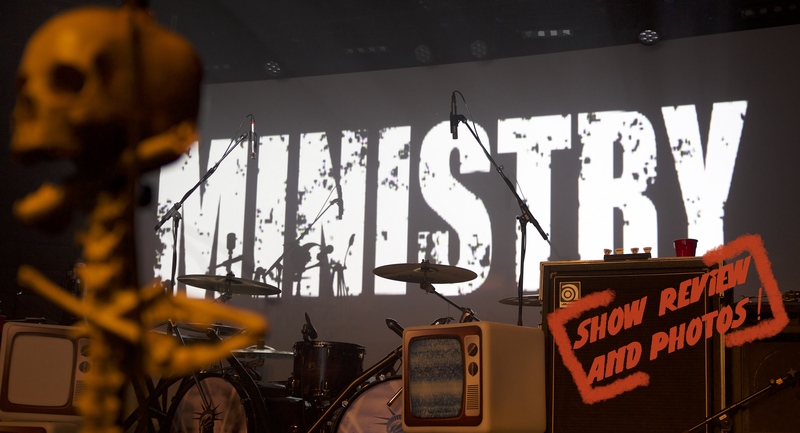 It was fantastic to see a band like Ministry come into Sacramento, where I truly believed did not have fan base here, and sell it out. To that, I say, cheers to Al Jorgensen for keeping that Ministry train rolling and showing the metal world that there can be a positive political metal band, and that they demand us to listen! « AFTERSHOCK 2017 : A Music Festival With a Lack of Identity?